Today I'm taking off my crafter's hat to put on my book lover/reviewer's cap. 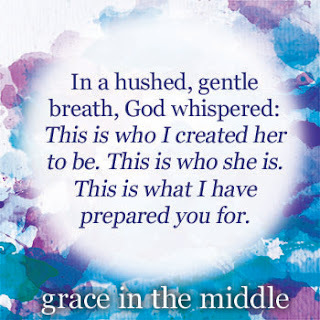 I'm part of a blog tour promoting Wendy Duke's first book, Grace in the Middle. This book is about Scott and Wendy Duke and some incredible challenges they faced. Like many young couples, they met at college, fell in love and married. When the time came to start their family, things didn't go as smoothly as planned. After several miscarriages, the Dukes were cautiously optimistic when they discovered Wendy was once again carrying a child. Just when they thought the Lord had given them the green light and that all would be well, they learned at an early doctor's appointment that "baby has only one leg." Wendy is honest about the struggle she faced in her spiritual life when she learned this news. However a still small voice kept reassuring her that this was all part of His plan. After their daughter was born, while they were breathing sighs of relief, they learned even more devasting news: their newborn daughter had cancer. Wendy is so transparent in her physical, emotional and spiritual struggles. I had to chuckle when she admitted that she "wasn't on speaking terms" with God for awhile. So often, even when writing about difficult times in their lives, Christians are afraid to admit that they "aren't on speaking terms" with God or that they are angry with Him. Wendy's honesty about her thoughts, feelings and struggles was quite refreshing. Wendy reminds us that even when she didn't feel His presence, God was always there for her. He showed His love for her through the love and support of their family, friends and church family. The first few years of Savannah's life were very difficult and yet Wendy and Scott learned so many spiritual lessons and experienced the growth that only deep trials can bring. Their story hit much closer to home when I read that Savannah had surgery and treatment at Children's Hospital in Cincinnati, OH. Since we had also spent a lot of time there with our own children, I could see those halls, the cafeteria, etc. We even were there during the same time period. I wonder if we passed each other in the halls. She shared how one evening in that hospital hall way, on her knees, she surrendered her will to the Lord. Just as she was transparent about her spiritual struggles, she is also so honest about the joy that comes with surrender. The book includes a chapter written by Savannah. At almost 15, she is living a normal, active teenage life. She has a great outlook on the events of her life. As a parent, I had to rejoice when she said she didn't remember some of the worst episodes in her early years. This book had me in tears and also literally laughing out loud. The story moves along at a good pace and Wendy doesn't get too "preach-y." We all struggle in our spiritual walk and it was such an encouragement to not only have the author admit she struggled but also take us through the process to eventual victory.This was one of those books I just couldn't put down and it occupied my thoughts for days after I finished it.